a. An interim injunction doth issue restraining the Minister in charge of Kampala Capital City, his agents and or servants and all persons acting under his authority from acting on the Report of the KCCA Tribunal (2013) Constituted to investigate allegations against the Lord Mayor of Kampala Capital City Authority Pursuant to a Petition of CounciLlors of Kampala Capital City Authority until the final determination of Misc. Cause No. 362 of 2013.
b. 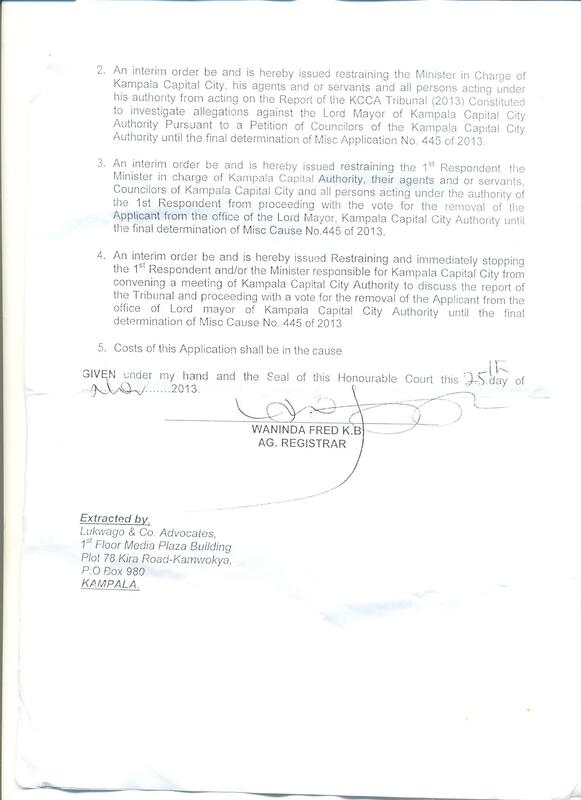 An interim injunction doth issue restraining the 1st Respondent, the Minister in charge of Kampala Capital City Authority, their agents and or servants, CouncilLors of Kampala Capital City and all persons acting under authority of the 1st Respondent from proceeding with vote for the removal of the Applicant for the office of the Lord Mayor, Kampala Capital City Authority until the final determination of Misc. 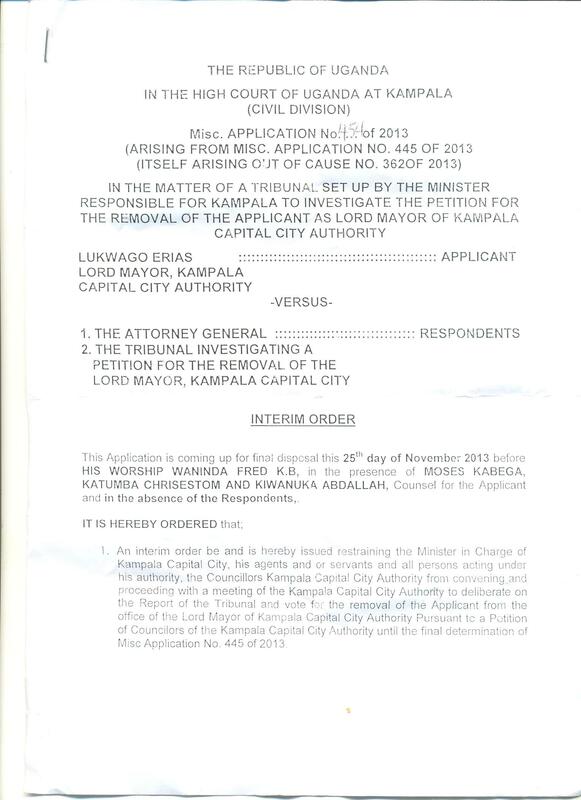 Causes No 362 of 2013.
c. An interim injunction doth issue restraining the 1st Respondent and/or the Minister responsible for Kampala Capital City from convening a meeting of Kampala Capital City Authority to discuss the report of the Tribunal and proceeding with a vote for the removal of the Applicant from the office of Lord Mayor of Kampala Capital City Authority until the final determination of Misc. Cause 362 of 2013.
d. An interim injunction doth issue restraining the Minister responsible for Kampala Capital City from convening a meeting of Kampala Capital City Authority to discuss the report of the Tribunal and proceeding with a vote for the removal of the Applicant from the office of Lord Mayor of Kampala Capital City Authority until the final determination of Misc. Cause No. 362 of 2013.
e. Costs of this Application be provided for. Today, I have learnt that the High Court has issued an interim injunction barring myself, the Authority councillors and agents and other persons from convening a meeting to deliberate on the Tribunal’s report and not to conduct any further acts pursuant to that report until the main cause is heard. ATTORNEY GENERAL’S STATEMENT ON THE CASE OF ERIAS LUKWAGO VERSUS THE ATTORNEY GENERAL AND THE TRIBUNAL INVESTIGATING THE PETITION AGAINST THE LORD MAYOR VIDE MISCELLANEOUS APPLICATION 445 OF 2013. 1. An interim injunction restraining the Minister in charge of Kampala Capital City from acting on the report of the KCCA tribunal. 2. An interim injunction restraining the Attorney General and the Minister in charge of Kampala Capital City and the KCCA Councillors from proceeding with the vote for his removal from office. 3. An interim injunction restraining the Attorney General and/or the Minister for Kampala Capital City from convening a meeting of KCCA to discuss the tribunal report. 4. Costs of the application. The former Lord Mayor Erias Lukwago filed an application against the Attorney General and the tribunal investigating the petition against the Lord Mayor vide Miscellaneous Application 445 of 2013, seeking the above interim orders. By this time, the Minister for Kampala had convened a meeting of the Authority scheduled for the 25th of November at 9.00 a.m. at KCCA Authority chambers. On the said date, the Authority councillors in attendance voted on a resolution to remove the Lord Mayor from office.Twenty nine Authority councillors voted in favour of the Lord Mayor`s removal and three voted against. The Lord Mayor ceased to hold office at 9.30 a.m. when the said resolution was passed by the Authority. On the same day the Assistant Registrar of the High Court issued an interim order that sought to stop the process of impeachment of The Lord Mayor. Unfortunately, by the time the order was issued and communicated, the process of impeachment had been completed. This position was communicated in my letter to the Court on 26th November 2013 and in the State Attorney’s address to the Learned Judge before the Court delivered its ruling today. The Court however felt it was better to deal with the application and the facts as they stood when the application was filed on 20th November 2013 ie. as if the meeting in which the Lord Mayor was impeached had not taken place. The interim injunction has thus been issued today, the 28th of November 2013 seeking to stop the meeting that occurred on 25th November 2013. The interim injunction is therefore impossible to implement as we cannot stop a meeting that has already occurred. Infact the seat of the Lord Mayor has already been declared vacant and the Electoral Commission has accordingly been notified in accordance with the law. None of the reliefs granted to Mr. Erias Lukwago by the High Court requires his reinstatement to the office of Lord Mayor. The resolution passed by the KCCA councillors removing Mr. Lukwago from the office of The Lord Mayor remains valid. Much as it is the obligation and desire of this office to implement all orders of Court, the fact that the orders have been issued after the authority meeting has taken place and resolution for removal has been passed, this makes the orders unenforceable. I am however taking steps to have the order discharged by the Courts. AWAY from the positive and negative excitement around the Kampala Mayorship, I have always contended that a person equipped with education can become wealthy doing anything – even selling tomatoes, mangoes and entula – if the people who set up roadside tables along upcountry roads selling this stuff make any sort of living. Say a peasant woman in the village can eke out a living in her mud-and-wattle house, with her children under Universal Primary and Secondary Education, and no worries buying fuel for cars or paying DSTV; if you added just a bit of mathematics, a few history essays, and some knowledge of geography to her equation, she could turn the stall into a thriving chain of two stalls covering both sides of the road. In practice, she sits by the roadside waiting for our convoys to slow down and purchase her wares en route back from weddings, burials and weekend visits, us believing they’re cheaper than we find on Saturday morning market visits to Nakasero, Nakawa, Kalerwe or even supermarket vegetable stands. Our education doesn’t seem to stretch enough to make us calculate the cost of driving our vehicles 200 kilometres down the road for a day, with two people per vehicle, vis-a-vis the saving we make buying these tomatoes, entula and mangoes. It’s as confounding as a Ushs36billion parking lot for 300 people. Sorry – this is an unfair juxtaposition of conundrums; also because the parking lot one is QED if you consider that it caters for staff of the House as well as the MPs – and maybe visitors, too, so it’s not as ridiculous as it first sounds (but is still quite ridiculous). While the Ushs36billion angst was growing this week, I bumped into the Rolex for three days straight. Day One: an unnamed but highly placed government official confessed her puzzlement to me over the Rolex, having never eaten one. She knew about the general excitement around the things, the recipe involved, and their ubiquity in Kampala and beyond. She even knew that anyone’s political survival in the city is linked to their not disrupting, or being seen to disrupt any element of the Rolex business. “I don’t think they will start riots now…” part of our discussion went, but we were wrong – even though I later realised that the running battles between the rioters and police were not in Rolex-heavy locations. Day Two: I came across a fellow promoting The Sound Cup, a new eatery run by musician Maurice Kirya (disclaimer: he is my cousin, Maurice is, but that’s not why this is here), and in particular it’s Rolex edition. As far as this chap was concerned, this is the first upmarket place in Kampala with the Rolex. It is not – I’ve met them at Endiro Coffee, the Sheraton, the Hub at Nakumatt, and some other place – but Maurice reportedly adds panache (no pun, surprisingly, as the other one is spelt with a ‘k’!) to it, as to everything else. He talks it up like it is a romantic tryst you don’t want people to know about yet that feels so good you can’t help but take it public. He has a theory about how a Rolex is eaten: not with knife and fork, but with bare hands; looking it straight in the eye with an intimacy only a Ugandan dish can share with its devourer, giving up large, moist, decisive bites at a time. Day Three: Over lunch with banker Mark Bitarabeho, he had me speechless with his tales of poultry farming and its successes and potential. I’ve heard many people tell me about this poultry business and how it has flared up in recent years, and this week I put a finger on it. Mark told me about a mutual acquaintance who works in a telecom firm who drops off about 100 trays of eggs every morning by 7:00am to a different customer each day on her way to work. They all pay her hard cash and she goes about her day with about Ushs700,000 in her handbag. Every day. And those customers want 300 trays a day! Then I remembered seeing a number of Noah’s and other ordinary vehicles clogged up with eggs in the morning traffic, being driven by city-employee type people. Where do those eggs go? And why did the price of eggs go up? Have you noticed the boiled eggs? No? People walking around with plastic tubs or baskets full of eggs and a small canister of salt? Each egg is Ushs500 – which immediately makes a tray Ushs15,000 – more than 100% profit! And there are more people selling boiled eggs in Kampala than there are Rolex stands. The people making money from the Rolex and the boiled egg include the Rolex seller, the likes of Maurice Kirya and Endiro, the flour and cooking oil suppliers, the manufacturers of the flat Rolex frying pans and sigiris, the charcoal sellers, the corporate people hatching eggs in their compounds, and the chicken suppliers like Biyinzika, et al. It all sounds so simple that it seemed to me that if a political party were set up with a manifesto that involved getting more people to eat more eggs, it would quickly mop up both massive support and funding; and using the benefit of education, spend more on hatcheries and better chicken rearing methods than on parking lots, and less time mobilising rioters and more mobilising chickens. And it would work on developing Uganda one rolex at a time. THE leading story last Sunday about the death of Mika, ‘King’ of the Ngamba Island chimpanzees, and an ensuing power struggle within the chimp community came with two coincidences: first, the story was interestingly placed right under another about power struggles within the FDC and; second, I happened to be spending the weekend with chimpanzees in Kibale and had decided that all Ugandan politicians must go tracking chimpanzees as soon as possible. The first coincidence is obvious enough without my having to risk being accused of insulting an entire political party in Uganda. The second coincidence had me tracking chimpanzees on Saturday morning for three and a half invigorating hours during which the analogy was formed solid. Chimpanzees are our closest relatives, and bear many characteristics that are uncannily similar to those of human beings. But they are wild animals, and can be extremely violent and vicious – another similarity. 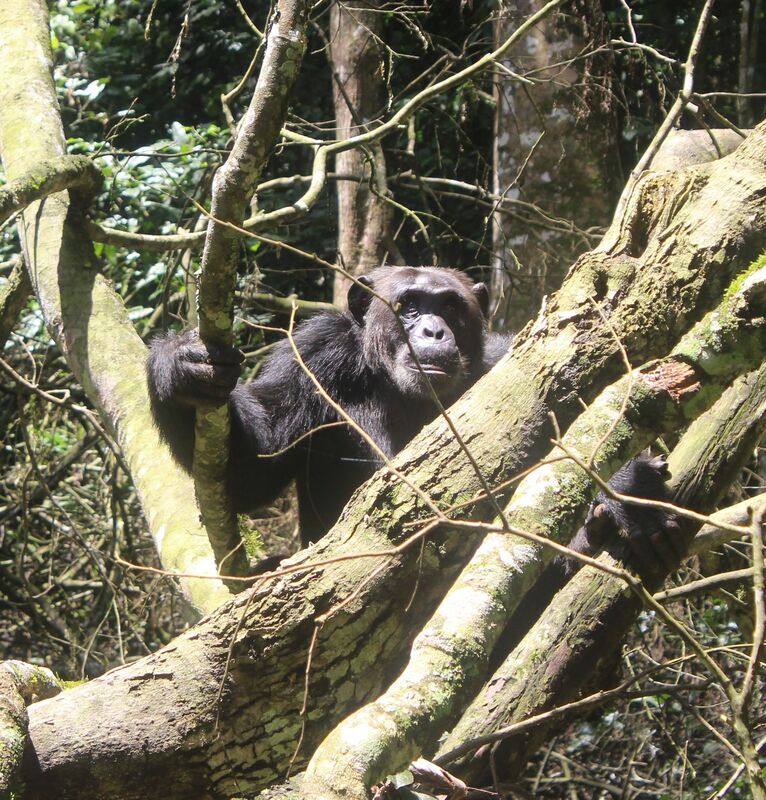 Our Wildlife Authority Ranger Guide, a friendly, well-spoken fellow called Gerald, regaled us with stories about the chimps (the one above is Magezi, the head of the community of chimps that I visited) and their peculiarities, affirming my thoughts about chimps and politics. 1. Like bad politicians, chimpanzees are hard to see unless habituated over time. Habituation meaning being forced to get used to human beings following them around, by those humans following them around, just like we do politicians. 2. They tend to climb high up into lofty trees and stay there out of reach of humans. People find themselves standing at a distance pointing at the bad politician saying, “He is there!” rather than interacting openly with them. 3. They screech rudely and shout a lot, unintelligibly to us. 4. They swing about from one position or issue to another almost aimlessly – like a chimp from branch to branch. 5. They also sit about for long periods scratching themselves, yawning and eating. 6. And on the ground, they shuffle past you with barely an acknowledgement and don’t give a care about what you might want or need. 1. You have to walk silently through the forest, without crashing through the bushes, otherwise you could scare them off – the way some politicians scare their voters off. 2. Also, you have to be silent so that you hear the chimps from afar and head in the right direction – obvious link. 3. You must be patient – you could walk for hours before coming across the chimps, just so in politics – perseverance is key in getting places. Then the leaders would pick up on: 4. You have to walk single file, following one another, so there is always someone in front of you – just so in politics, because there is always someone who went before you whether you are President, King, MP or Chairman, and it’s important that you acknowledge them. 5. There is no need to overtake the person ahead since you all have the same objective, unless you are selfish – in politics, the objective is taking Uganda forward, and you should all move together towards it. 6. You have to follow the person ahead of you carefully, because when they stumble, you learn not to, and when they step surely, that’s what you do – obvious lesson. 7. The person walking ahead of you pushes branches and twigs that may whip back and lash you in the face if you are following too closely – keep a safe, sensible distance to avoid this, and don’t be a sycophant walking blindly. The list goes on: 8. There should be a guy with a gun, as our Ranger Guide had, not to help find the objective, but in case of trouble – again, obvious. 9. And if you’re in the lead, always look back to make sure there are people following behind you, and if they’ve gone, find out when and why so you all get back on track. The list is really long – but go tracking chimpanzees for the rest of it; the fee is payable to the tourism industry by way of hotel accommodation, food and tracking permits.